Not all Canadian snowbirds who spend their winters in the U.S. are looking to settle in the typical “hot” spots (both in terms of temperature and popularity). Some prefer the mild, spring-like weather and unique experiences that can be found in alternate locations. These lesser-known snowbird destinations in the southern U.S. feature many of the same benefits found in the more popular states, such as great beaches, mild climates, and plenty of cultural activities and attractions. Best of all, they are generally more affordable and less crowded in the winter. We’ve created the following guide to help you navigate your way through these hidden gems. South Carolina is growing in popularity with Canadian snowbirds. The state offers miles of sandy beaches along its extensive coastline. Snowbirds will enjoy a relatively low cost of living here and a mild climate during the winter months. South Carolina is also a golfer’s dream - there are over 350 golf courses in a wide variety of settings, including ocean front. Highlights include the Upcountry Golf Trail as well as some great golf courses in state parks such as Hickory Knob State Resort Park, just name a few. Then there’s the food - enjoy southern cooking and fabulous seafood restaurants for evenings out. Low Country southern seafood specialties are quite unique. 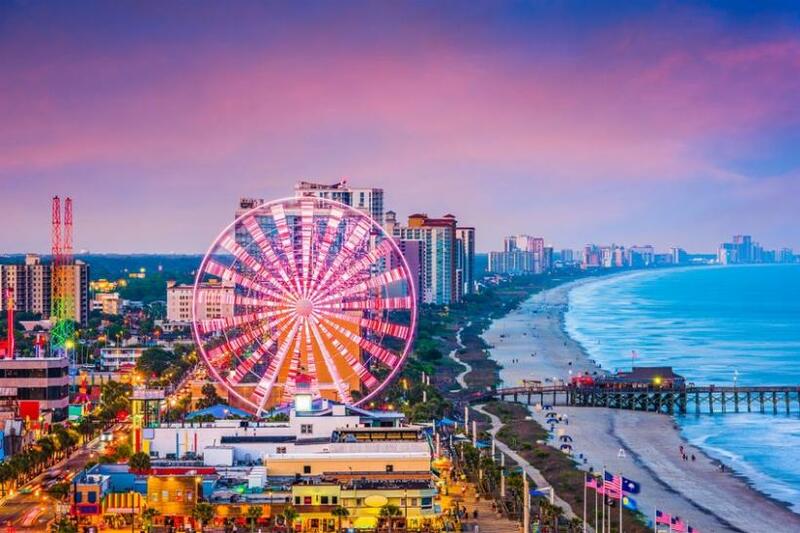 Myrtle Beach needs no introduction, as it’s been a favourite destination for Eastern Canadian spring breakers and families for years. But did you know that Myrtle Beach area has 100 golf courses? The area is a golfer’s mecca. The “Beach” is actually 60 miles of gorgeous Atlantic beach with a pier and lots of restaurants and activities at its heart. Watersports, sailing and deep-sea fishing are available year-round. Accommodation costs vary in the area and can be quite reasonable in the winter off-season. The historic port city of Charleston dates back to 1670 and offers a wonderful place for snowbirds to explore and stay in South Carolina. It’s one of the most popular Southern cities and draws millions of visitors every year to its romantic historic district. Hilton Head is another golfer’s paradise and a beautiful place to spend the winter, with many high-end hotels and condo developments. It’s just north of the Georgia border and well placed for visiting Savannah and the low country while you are there. While North Carolina might seem a little far north for snowbirds, there are actually some lovely areas in the state that have a very early spring. North Carolina has a growing snowbird following and much to offer to those who prefer a cooler climate. The state has many beautiful areas, lovely scenery, unique historic and cultural activities and of course, world-class golf courses including the legendary Pinehurst. The east coast area on the Atlantic Ocean and the Outer Banks barrier islands are home to a number of snowbird destinations and RV Parks with affordable accommodation prices. North Carolina is home to some of the best golf courses in the U.S., with Pinehurst Village generally considered the golf capital of the state. The Pinehurst Resort is situated in the Carolina Sandhills, sitting on over 2,000 acres. There’s also the Country Club of Asheville, Quail Hollow near Charlotte and Linville, the oldest golf course in the state. Georgia offers Canadian snowbirds southern charm and cuisine and lots of history. The climate is mostly mild during the winter and early spring, and snowbirds who chose Georgia will find it generally more affordable than many other snowbird destinations. Snowbirds generally gravitate towards the southern regions of the state, although a visit to Atlanta is always interesting with its many sports teams, museums, and restaurant scene. With quite a large snowbird population, Savannah is one of the most historic cities in the United States and is a great choice for Canadians who want some history and culture along with their mild weather and nearby beaches. Tybee Island is near Savannah and accessible by a causeway. Very affordable in winter, the island has great beaches and lots of different types of accommodations. Further south, there’s Jekyll Island, another snowbird favourite with great beaches and a friendly, laid-back atmosphere. Both places offer a wide variety of affordable Georgia snowbird rentals. Snowbirds who like to gamble will feel right at home in Mississippi. The Mississippi Gulf Coast is well known for its casinos and miles of sandy beaches. The majority of Canadian snowbirds who spend their winter in Mississippi stay close to the Gulf of Mexico because of its beautiful beaches and plenty of sunshine. Further inland there are lots of places to experience southern history and culture. Popular snowbird communities along the Gulf include Biloxi which is home to several casinos with luxury spas, big-name entertainment, great shopping and dining. Nearby Gulfport also has casinos and is popular with snowbirds for its affordable Mississippi rental accommodations. Louisiana is also attracting its share of Canadian snowbirds. The state offers local Cajun culture, entertainment and cuisine, as well as a low cost of living. The Louisiana climate is humid sub-tropical. Summers are hot and humid, but the winters are mild, which means you’ll want to stick close to the southern Gulf Coast if you want warmer weather. And of course, if you are wintering in the state, you must make a trip to New Orleans for some great food and music! Alabama is also experiencing a growing snowbird population due to its expansive gulf coast, southern charm, great golfing and affordable cost of living. Snowbirds will discover Civil War and colonial history as well as early Native American history. Canadian snowbirds find the people in Alabama very welcoming. The climate is mild but pleasant and the long sea coast has many great harbours and beaches to explore – not to mention the fishing charters. Snowbirds flock to the Gulf Coast along the Gulf of Mexico. Mobile, Gulf Shores and Orange Beach are all popular destinations offering affordable snowbird rental accommodations as well as RV Parks. There are more than a dozen great golf courses in the area. Nevada is always popular because of its casinos, but the destination is also attracting snowbirds because of its dry climate and moderate winter temperatures. And there’s so much more to Nevada than gambling, including world-class dining and entertainment in Las Vegas and many excellent golf courses across the state. The Mojave Desert offers spectacular scenery and great hiking opportunities for those who like to be active. Snowbirds will find affordable accommodation options throughout the state, from house and apartment rentals to RV and mobile home parks. Apart from Las Vegas itself, snowbirds should check out Boulder City, Carson City, Mesquite, Laughlin, Henderson and Primm. New Mexico is steeped in Spanish and Native American history and culture and devotees of this state love the artsy communities and unique blend of cultures. Of course, you will also find absolutely spectacular scenery and a moderate dry climate with plenty of sunshine. New Mexico is actually drawing a steady stream of Canadian snowbirds who love exploring the dramatic landscapes, rich culture and art colonies. Snowbirds have settled in various communities in New Mexico including lovely Santa Fe, Las Cruces, Taos, Los Lunas, Albuquerque and Rio Rancho. There are lots of snowbird rentals available and the prices are reasonable.